Explosive fights within minutes! 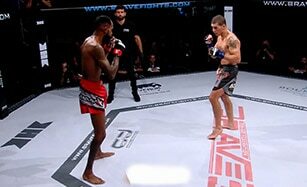 Brave 6 continued to wow the audience with it's tremendous takedowns and knockouts in just a span of minutes in every fight. There was no dull moment as the strongest fighters face each other for worldwide bragging rights. Catch Rufat Asadov vs Ikram Aliskerov in this part and feel the power of each fighter on your screens!